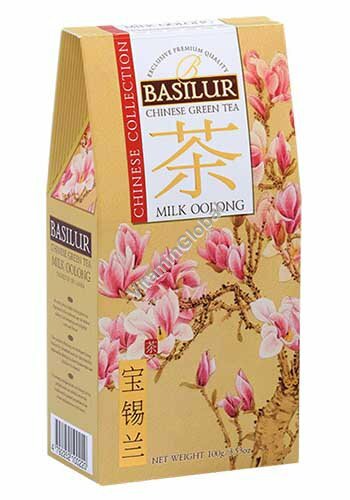 Chinese Green Tea Milk Oolong an exotic blend of milky Oolong green tea, fragranced in the traditional age old method adding to an enchanting and delightful scent and flavor. Ingredients: Ceylon green leaf tea blended with other origin green leaf tea Milk Oolong and natural flavor milk. Brewing instructions: Place one teaspoon of Milk Oolong in a cup and add 80C/176F water. Let steep for 2-3 minutes. Add sweetener if desired.